These puppies — Chocolate Chocolate Chip w/ Walnuts — sure weren’t much to look at, but they went fast. I didn’t realize when I made ’em how similar they are to a classic cookie from Braums. Now I’m craving the original, which probably means a trip to Hillsboro in the near future (outlet land here I come). 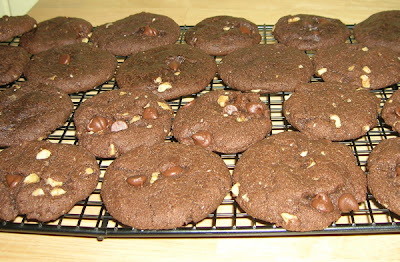 Next time I prepare these cookies I’ll place the chocolate chips and the walnuts on the dough once the cookies are on the baking sheet (instead of mixing them into the batter). Or, I’ll try another recipe variation — cherries! Can we call you Bobby Crocker? Does anyone even get that reference these days? Oh yeah, probably not a lost reference — she/it's a staple. And yes, you and the hordes of admiring fans may call me Bobby Crocker. Good call on the cranberries and white chocolate chips! so you get to TX and bake? where was this baking love in the city of rock? I'm feeling left out here. left out, and hungry. I didn't intentionally leave y'all out of the baked goodness. I started experimenting once I got here. ... A great kitchen and a 40-hour work week help make it possible.